What I like about reading books about Hollywood glamour and fame from the early stages of film and celebrity is the realization that although over seventy-five years has passed since a lot of the stars have graced the big screen, we are not all that different in today’s age. Sure the clothes are different and technology has come a long way, but what surprised me most was, something rather miniscule to say the least, was that I was under the impression that the word c*#ksucker was more of a modern insult, but NOOOOOOOOO, it was used by Frances Farmer on one of her routine trips to the cop shop and a term of endearment for said police officer. Or the word s@%thead being used by John Barrymore as he affectionately called his young protégé John Carradine. I suppose I was under the impression that everyone dressed to the nines, expressed themselves using the King’s English and had endless amounts of class. This book went a long way in showing me different. This book is true to its form as it genuinely is a tale of drunken stupors, debauchery, and criminal delinquency. The author also provides inner details of the establishments where the misbehaviour occurred and even supplies the recipes to the cocktails that help encourage these societal disgraces. With that said there were some sad and tragic tales that changed my perspective from section to section. The story of Veronica Lake goes to show how a person with a mental instability or a social stigma can fall through the cracks. How Clara Bow was the victim of prejudices because of her good looks and birthplace, when in truth she was just a scared little girl trying to be liked. It doesn’t matter how talented you are, Louise Brooks shows how important performance on the casting couch really is for your career longevity. Ramon Navarro was a gay actor who tried to keep his sexual orientation a secret when everyone else in Hollywood already knew. He wouldn’t go through with a “lavender”(token) marriage even if it meant the death of his career. Robert Benchley and Charles Butterworth was a true story of a friendship, or perhaps there was something more there. A broken heart leading to the end of Frances Farmer’s promising career. Trying to live the American Dream, Anna May Wong was a superstar in Europe but she ended up tragically finding out that America had failed her, America had killed her. This book is a lot of laughs and very enjoyable, but there are also some stories that make you ponder, and also leave you feeling sadness for some of these prodigious yet sympathetic characters. Being a younger guy in relation to the celebrities and industry hard hitters in this book I like being able to put an image to the name and have them develop a larger than life persona to even becoming a caricature of themselves. With the advent of social media, celebrity reporting and “journalism” has changed drastically, maybe the secret would have been out for Louella Parsons had she been in the industry today. What we used to have to read in the aisles of the grocery store we can now tune in daily at whatever time on the television or at whatever time online to find out the latest gossip. Like we all know Charlie Sheen’s misgivings, but now we can stay up to date to find out the latest blonde pornstar he beds and how long it will be before she takes him to the financial cleaners. We all know Courtney Love, but now we can find out the few times when she isn’t being a train wreck. With the celebrities in this book, for me personally, I am just going crazy with all these peculiar situations using my imagination to bring them to life and was intrigued to find out more about them. From what I could gather was that Richard Burton could drink the most, Lawrence Tierney and Oliver Reed were in a dead-heat for the most hated, Jack Palance was the toughest, John Barrymore would go the greatest lengths for a drink, D.W. Griffith was the most stubborn, Jean Harlow seemed like the most fun, W.C. Fields was a romantic, Joan Crawford was the most demanding, Dennis Hopper and Oliver Reed were competing for the craziest, Errol Flynn was the biggest womanizer, Lana Turner was continuously looking for wedded bliss, Steve Mcqueen was the coolest, and Cary Grant was and still remains one of Hollywood’s biggest mysteries. My favourite stories were John Cassavetes, Buster Keaton, John Barrymore, William Holden, the whole Dennis Hopper/Rip Torn/Norman Mailer and Apocalypse Now stories, Raymond Chandler, Humphrey Bogart’s stuffed panda episode, Cary Grant, John Wayne. Some of the stories made me dislike them afterwards like Roscoe Arbuckle, Stan Laurel, Louella Parsons, and Fritz Lang. 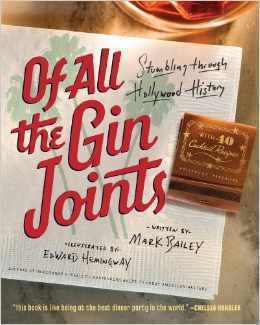 This book had it all: miniature biographies, wicked anecdotes, hilarious quotes, and devilish cocktail recipes; this book is great as it takes you on a journey through all of the celebrity hot spots, some of the more infamous movie sets, and allows you to be a fly on the wall as you experience some of the crazy behaviour of film industry and literary giants. “With the restaurant’s ‘seen it all’ cool, simply being famous is not enough to get you a table: seating is limited, and if you’re not a regular, you may have a long wait ahead of you. Ask John Travolta: at the height of his Saturday Night Fever fame, he showed up one night with a date but without a reservation. When told it would be two hours before he could be accommodated, Travolta dropped his name with a defiant ‘don’t you know who I am?’ tone.